A LOT Polish Airlines 787 Dreamliner comes in for a landing at O'Hare International Airport on Wednesday, Jan. 16, 2013. 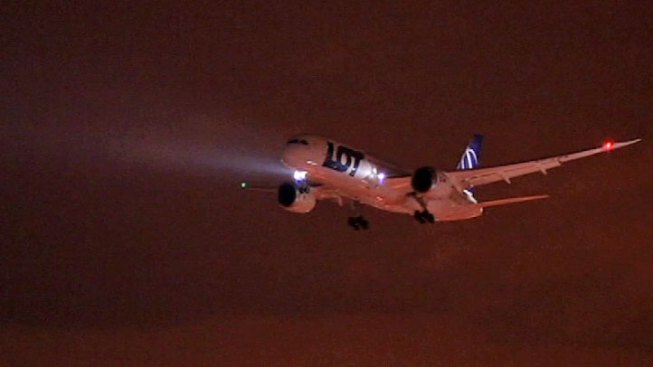 LOT Polish Airlines' new proud possession -- a Boeing 787 Dreamliner -- landed safely in Chicago on Wednesday night, but when it'll head back to Warsaw was unclear. The Polish airline canceled a big media event to welcome the plane and decided late in the day to follow the directive of the U.S. Federal Aviation Administration in grounding Boeing's newest and most technologically advanced jetliner until the risk of battery fires is addressed. Domestically, the temporary grounding only affects United Airlines, which is the only U.S.-carrier operating the supersized jet and has a fleet of six 787s in service. The FAA said it would work with Boeing and U.S. airlines to develop a plan to allow the Dreamliner to "resume operations as quickly and safely as possible." The government's decision was the latest setback for a plane that was supposed to set a new standard for jet travel but has been beset by one mishap after another. For the second time in two weeks, a smoking or burning battery has been tied to an emergency aboard a 787. Almost half of the 787s that have been delivered have now been grounded for safety checks. And the latest incident raises the risk that the jet's electrical problems are more dangerous than previously thought. So far, no one has suggested that the plane's fundamental design can't be fixed. But it's unclear how much will need to be changed. The remedy could range from relatively quick-and-easy improvements to more extensive changes that could delay deliveries just as Boeing is trying to speed production up from five planes per month to 10. On Wednesday, Japan's All Nippon Airways said pilots smelled something burning and received a cockpit message warning of battery problems while flying from Yamaguchi Ube airport in western Japan to Tokyo. They made an emergency landing at Takamatsu airport in western Japan, and passengers evacuated using inflatable slides. An inspection found that a flammable liquid had leaked from the main lithium-ion battery, which is below and slightly behind the cockpit. Investigators found burn marks around the damage. "Anytime you have a fire on board — whether it's the battery that has caused it or a passenger that caused it or another electrical component — that's a very a serious situation on an aircraft and something not to be taken lightly," said Kevin Hiatt, president of the Flight Safety Foundation. Japan's Kyodo News agency quoted transport ministry investigator Hideyo Kosugi as saying that the liquid leaked through the electrical room floor to the outside of the aircraft. The transport ministry said the leak could have led to an accident. ANA, which operates 17 of the jets, and Japan Airlines, which has seven, said they won't fly their 787s until they complete safety checks. That's almost half of the 50 planes Boeing has delivered since handing the first one over to ANA in late 2011. Just last week, a battery on a Japan Airlines 787 caught fire soon after the plane landed at Boston's Logan Airport. It took firefighters 40 minutes to put out the flames. The 787 is the first plane to make extensive use of lithium-ion batteries, which have raised concerns in the past for their potential to catch fire. The Federal Aviation Administration has given the batteries extra scrutiny and issued a special rule for their use in the 787. The plane has two batteries — the main one near the front and a second one in the rear. Boeing and the airlines will need to move quickly to determine whether the problem is a flaw in the batteries themselves, in the plane's wiring or in some other area that's fundamental to the plane's electrical system. Boeing has booked orders for more than 800 of the planes from airlines around the world attracted by its increased fuel efficiency. The jet's lightweight design makes it more of a fuel-sipper, and it's so lightweight in part because it uses electricity to do things that other airplanes do with hot air vented through internal ducts. So a 787 with electrical problems is like a minivan that won't haul kids. It goes to the heart of what the thing was built to do. Before it carried paying passengers, the 787 was closely reviewed by inspectors from Boeing and the FAA. Mike Sinnett, chief engineer on the 787, said last week that the plane's batteries have operated through a combined 1.3 million hours and never had an internal fault. He said they were built with multiple protections to ensure that "failures of the battery don't put the airplane at risk." The lithium-ion design was chosen because it's the only type of battery that can take a large charge in a short amount of time. When he spoke last week, Sinnett said Boeing was not considering replacing the lithium-ion design with another type of battery. Neither GS Yuasa Corp., the Japanese company that supplies the batteries for the 787, nor Thales, which makes the battery charging system, would comment on the recent troubles. Japan Airlines and All Nippon Airways are two of the 787's biggest customers. ANA was especially proud of its 787s. Its executives' business cards and the top of its website read "787" and "We fly 1st." ANA got the first one Boeing delivered in late 2011, more than three years late. Other 787s have had problems with certain electrical panels and fuel leaks. Back on Jan. 9, ANA canceled a domestic flight to Tokyo after a computer wrongly indicated there was a problem with the 787's brakes. Two days later, the carrier reported two new problems with the aircraft — a minor fuel leak and a cracked cockpit windscreen. Many of the 787s problems are typical of well-established planes around the world, Hiatt said, adding that he would have no qualms about flying aboard a 787. "That airplane is the most scrutinized plane in the air," he said. "I would get on the airplane tomorrow." Transportation Secretary Ray LaHood dismissed any doubts that the FAA was not as diligent as it should have been when certifying the plane. "Our people are the best, but we need to work with Boeing and to make sure everything we've done has been done correctly," he told reporters at a luncheon Wednesday in Washington. Wednesday's LOT Polish Airlines flight was the first from Europe. The carrier, with eight of the 787s in its fleet, was beginning regular flights between O'Hare and Warsaw's Frederic Chopin Airport. Earlier, a LOT spokesperson said that because its planes are among the later ones built by Boeing, they received "proper modifications which reduce technical problems" seen in the 787s of other airlines. The spokesperson declined to elaborate. Boeing was already under scrutiny for last week's fire, which was also tied to the battery in the back of the plane. That fire prompted investigations by the National Transportation Safety Board and the Federal Aviation Administration, and the FAA later said it would review the design and manufacture of the plane, focusing on its electrical systems. The NTSB said Wednesday that it would send an investigator to Japan to join the latest probe, and that representatives from the FAA and Boeing were on their way, too. United frequent flier Josh Feller said he changed his plans to fly a United 787 from Los Angeles to Houston next month because of the 787's troubles. "I've been following the 787 news closely, and the latest incident finally spooked me into changing my flight," he said by email. "It's an unnecessary risk, and since I was going out of my way to fly the plane in the first place, decided to change flights." He also wanted to avoid any disruptions if United eventually grounds the 787. Boeing shares dropped $2.60, or 3.4 percent, to close Wednesday at $74.34. They're down 4.3 percent since the first fire. Also Wednesday, Goldman Sachs dropped Boeing from its "conviction buy" list of top picks, although it left the shares with a "buy" rating.